Upton Park, East London, England. Prior to kick-off, Andy Carroll had failed to score a goal since March - that statistic was blown to pieces, however, by the full time whistle as his brace lifted West Ham over Swansea. West Ham or Swansea could've gone into the top four of the league with a win, but it was the Hammers who were nominated to go higher in the table. Bony opened up his burst of freedom early with a goal of some class, striking low into the goal. It was all West Ham and that was Swanseas' first attack against the run of play. Carroll scored, West Ham made a high cross work, Jenkinson swung a ball in from the touchline, and the Englishman sent a lethal header back across goal, past Fabianski. West Ham were level. Nolan got the ball, feeding Sakho, who sent a ball across, but was well defended. The Hammers had a corner, Carroll found himself unmarked 10 yards out. He got the header into the top corner and West Ham took the lead as the towering forward scored his first goal in nine months. Sakho charged into the box Fabianski came out, tumbling into the striker, who continued on to take a shot onto the post. But the referee brung the play back, the free-kick was awarded, and the keeper Fabianski was sent off. Carroll flicked on a goal-kick, Sakho was too quick for the Swansea defenders, that time he crashes home past Adrian, after trying on goal, three times before. 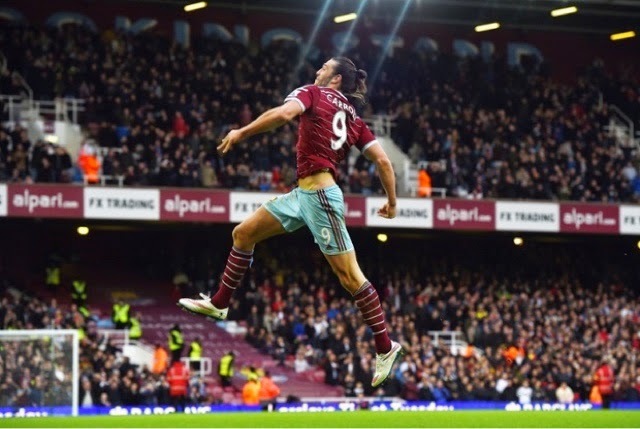 Andy Carroll scores a double as West Ham United side-step Swansea City.